Ohio START (Sobriety, Treatment, and Reducing Trauma) is an intervention program that provides specialized services, such as intensive trauma counseling, to children who have suffered victimization with substance abuse by a parent. The program assists parents of children referred to the program with their path to recovery from addiction. The Ohio START program is primarily funded through a Victims of Crime Act (VOCA) grant from the Ohio Attorney General’s Office and a State Opioid Response (SOR) grant from the Ohio Department of Mental Health and Addiction Services, which is shared among the counties over two and a half years. These grant funds will be used to help county children services agencies identify children who have been victimized due to parental drug use and provide them with specialized treatment for any resulting behavioral or emotional trauma. The grant will also fund victim services for parents with underlying victimization that may be contributing to their addiction. Casey Family Programs, which partnered with the Ohio Attorney General’s Office to develop the Ohio START program, is providing additional funds for the pilot. Both grants are administered by the Public Children Services Association of Ohio (PCSAO). In addition, the Ohio Department of Mental Health and Addiction Services has dedicated 21st Century CURES Act funding through the Institute for Human Services to support the training of and technical assistance to START PCSAs and their community partners. Sobriety, Treatment and Recovery Teams (START) began operation in Cuyahoga County (Cleveland) in 1997. START was adapted by Kentucky in 2006. The START program in Kentucky resulted in approximately half as many children returning to foster care due to parental addiction. Parents involved in the Kentucky program were also found to have twice the sobriety rate. Kentucky START has been rated as “Promising Research Evidence” on the California Evidence-Based Clearinghouse for Child Welfare. The effectiveness of the Ohio START pilot project will be studied by partners at The Ohio State University’s College of Social Work and the Voinovich School of Leadership and Public Affairs at Ohio University. Each school has generously agreed to evaluate the Ohio START program over the two-and-a-half-year grant period at no cost to Ohio START. Cohort 1 (light blue) counties include Athens, Brown, Clinton, Fairfield, Fayette, Franklin, Gallia, Hamilton, Highland, Hocking, Jackson, Lawrence, Meigs, Pickaway, Ross, Vinton, Warren. Two counties were added in 2018, Hamilton & Warren. 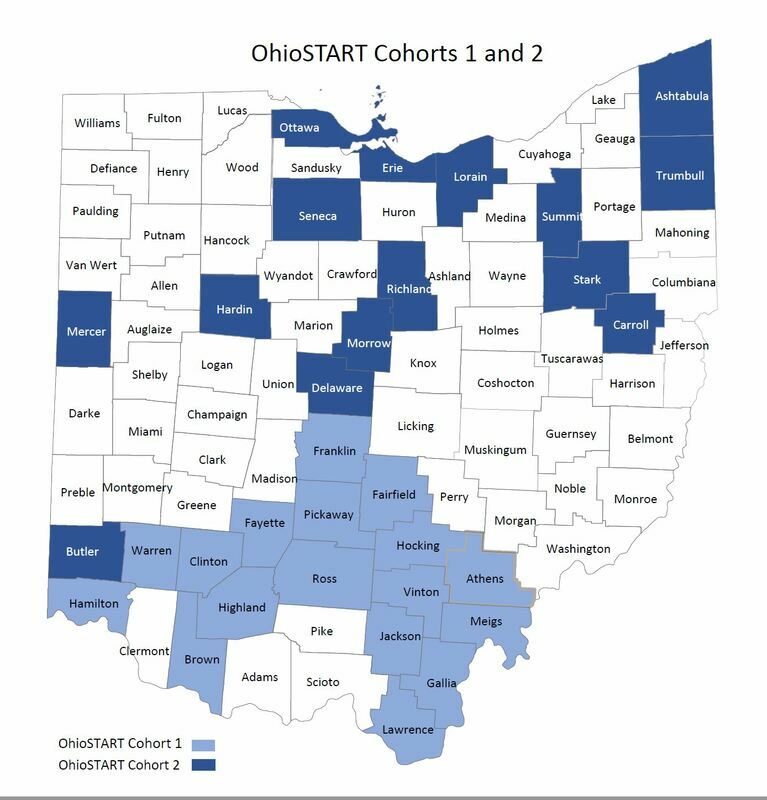 Cohort 2 (dark blue) counties include Ashtabula, Butler, Carroll, Delaware, Erie, Hardin, Lorain, Mercer, Morrow, Ottawa, Richland, Seneca, Stark, Summit, and Trumbull.